In a little nook on a quaint, tree-lined street in the Rogers Park neighborhood, success has struck. A small business district adjacent to the Jarvis Red Line El stop at the corner of Greenwood and Jarvis Avenues has taken on a new life – and a new name to match in Jarvis Square. Where the area was once infested with drug dealers and the only businesses around were a few liquor stores and a currency exchange, Jarvis Square has flourished into a bustling neighborhood corner in the last few years and business leaders say there are no signs of slowing down, even in a poor economy. Business owner and Jarvis Square resident Marie Winkler agrees. But all of the early success is in major jeopardy. The CTA has held several community meetings to get feedback on their proposal to shut down several stops, including Jarvis. 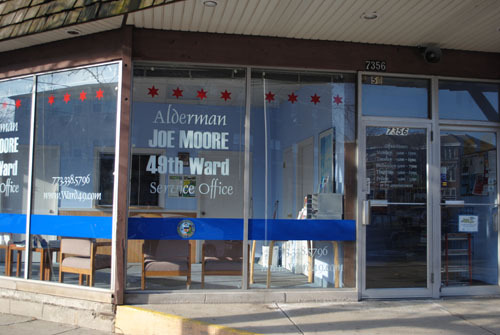 The response out of Rogers Park has been overwhelmingly negative, though none responded ‘no’ louder than 49th ward alderman Joe Moore, whose office is housed in the Square. "The station closings idea, I want nipped in the bud right away,” Ald. Joe Moore said at last month's scoping meeting in Rogers Park. “Let's just take that off the table. There is no discussion that needs to be had, as far as I am concerned. A bad idea, goodbye. It would have a devastating impact on my community." “It would demolish the area and negate all these changes,” Winkler said. 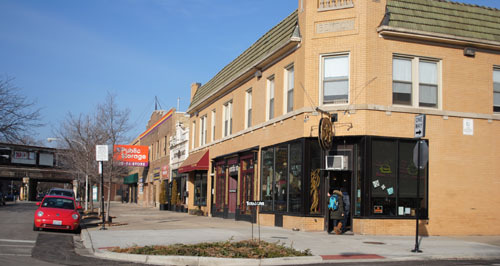 A dozen businesses are located in the Square now, making it one of the busier areas in Rogers Park. The Jarvis stop makes the businesses readily accessible to non-locals, and residents who live nearby are both thrilled and stunned to see a small cluster of businesses thrive here. Bartender Christina Kearns works at Poitin Stil, located at 1502 W. Jarvis, and has watched as business after business sprang up around the bar. “It’s grown surprisingly fast,” she said. 2006 saw the most openings so far in the area. Gruppo di Amici, Charmer’s Café and the Dagel and Beli opened almost simultaneously and have had great success in the area, Marshall said. Even during the recession, the majority of the businesses remained open and busy. Under the Table Books, a used book store, was one of the few to be forced to close during the downturn. Other businesses, like Charmer’s, haven’t seen much of a difference, according to Marshall. “We’re the only coffee house in a six block radius, so people tend to flock here no matter what,” Marshall said. “At a time when the CTA is looking to increase ridership, it makes no sense to close a train station and force commuters to walk blocks out of their way to another station,” Moore wrote in a recent e-mail to his constituents. Marshall agreed but doesn’t believe Charmer’s and the Dagel and Beli, owned and operated as one entity, will be affected if the closing took place. Kearns predicts that the bar, located at 1502 W. Jarvis Ave., would lose weekend and non-local business but wouldn’t be as affected as other businesses like Rogers Bark, a full-service grooming salon for cats and dogs, and others that are successful primarily because of location and proximity to public transportation. "If the El stop closes, we'd have to change the way we do business," Winkler, owner of Rogers Bark said. "Visibility would be my number one concern; nobody would see us." “The Jarvis Square business district depends on the Jarvis station for its survival. The recent rejuvenation of Jarvis Square would be undone in an instant if the el station were to close,” wrote Moore in the same e-mail.